Despite the fact that I'm pretty sure I have heat exhaustion and dehydration, I actually feel my best in weather like this. My Lyme symptoms are nearly nil, which is a far cry from the creaky aches and pains of dry, cold winters. I feel more alive and energetic. So, even though it's so hot I can barely think, I kind of love it. Feeling good is such a blessing. Temperatures like this require light and bright foods, like this salad. I had it for dinner last night and for breakfast this morning, and it was perfectly energizing. I am just starting to use the kitchen at my new apartment, and so far so good. This is the first blog post from my new abode! Yes, I've been absent from the blog lately because I was traveling and moving to a new place. But I'm back now, hooray! Papaya is ripe when the skin is a yellowy-orange color, perhaps with small spots of brown, and should yield sightly under the pressure of your thumb. The flesh inside will be a bright coral red/orange color and should be fairly soft, but it will never be very sweet. 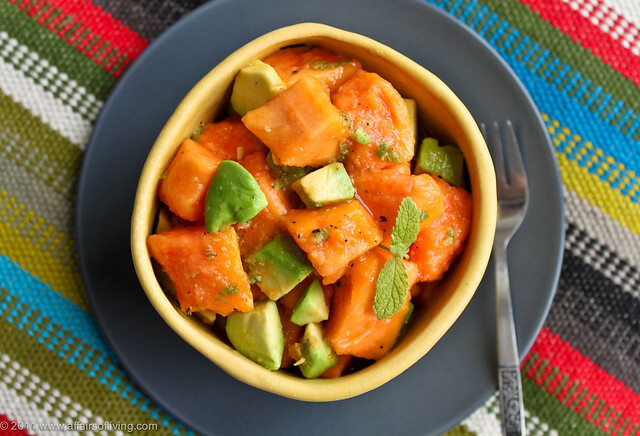 When papaya is green outside or inside, it is unripe and unsuitable for this salad. If you buy an unripe papaya, leave at room temperature for a day or two, and it should ripen up. For a sugar-free sweetener instead of agave, try adding 15-20 drops of liquid stevia instead, to taste - I like NuNaturals brand. Or, if you'd prefer a more savory salad, you can omit the sweetener all together. But really, I think it tastes better with a little sweet. Halve the papaya and scoop out seeds. Peel the skin off the papaya, then dice the flesh into bite-size cubes and place in a mixing bowl. Halve the avocado and remove the seed. 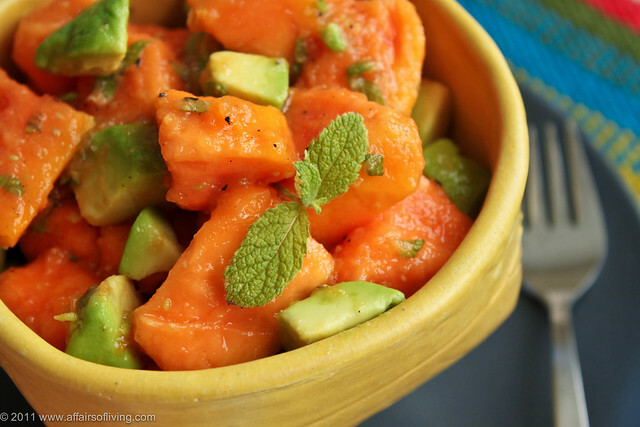 Peel off the skin, dice flesh into 1/2-inch cubes, and add to mixing bowl with papaya. Finely chop the 10 mint leaves, and add to bowl along with remaining ingredients. Gently toss to mix. Let sit for 10-15 minutes to flavor through, then serve. Garnish with remaining mint leaves and sprinkle with pumpkin seeds just before serving. Newer PostThe MPLS Swappers are featured in Minnesota Monthly!